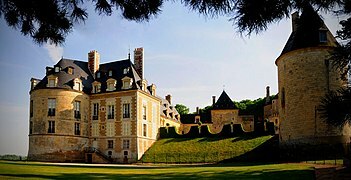 Cher is a department in the centre of France in the Centre-Val de Loire region. It is named after the Cher river, the most important river in the department. The department is one of the 83 French departments made during the French revolution, on 4 March 1790. The department was created from part of the former province of Berry. The new department had seven districts: Aubigny, Sancerre, Sancoins, Saint-Amand, Châteaumeillant, Bourges and Vierzon. The capital (now prefecture) was Bourges. In 1800, with the creation of the arrondissements in France, the seven districts were changed into three arrondissements: Bourges, Saint-Amand-Mont-Rond and Sancerre. On 10 September 1926, the arrondissement of Sancerre was eliminated. In 1984, a new arrondissement was created: Vierzon. 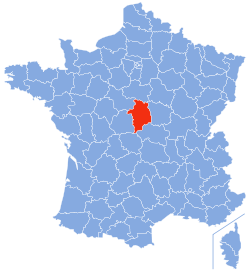 Cher is part of the Centre-Val de Loire region. It has an area of 7,235 km2 (2,793 sq mi). The highest point of the department is Le Magnoux (46°25′43″N 2°11′54″E﻿ / ﻿46.42861°N 2.19833°E﻿ / 46.42861; 2.19833), in the south end of the department in the commune of Préveranges, and that is 501 m (1,644 ft) above sea level. Cher, a left tributary of the Loire; it is 367.8 km (228.5 mi) long. The department is named after this river. Allier, also a left tributary of the Loire; it is 420.7 km (261.4 mi) long. Indre, also a left tributary of the Loire; it is 279.3 km (173.5 mi) long. Sauldre, a right tributary of the Cher; it is 183.1 km (113.8 mi) long. The Köppen climate classification type for the climate at Bourges is an "Oceanic climate" (also known as Marine West Coast Climate) and of the subtype Cfb. The average amount of precipitation for the year in Bourges is 665.5 mm (26.2 in). The month with the most precipitation on average is November with 66 mm (2.6 in) of precipitation. The month with the least precipitation on average is February with an average of 45.7 mm (1.8 in). The average temperature for the year in Bourges is 11.7 °C (53.1 °F). The warmest month, on average, is July with an average temperature of 20.2 °C (68.4 °F). The coolest month on average is January, with an average temperature of 4 °C (39 °F). 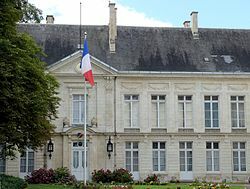 The department is managed by the Departmental Council of the Cher in Bourges. Cher is part of the region of Centre-Val de Loire. There are 3 arrondissements (districts), 19 cantons and 290 communes (municipalities) in Cher. The inhabitants of Cher are known, in French, as Chériens (women: Chériennes) or Berrichons (women: Berrichonnes). Cher has a population, in 2014, of 310,270, for a population density of 42.9 inhabitants/km2. The arrondissement of Bourges, with 173,889 inhabitants, is by far the largest. The Saint-Etienne cathedral in Bourges. ↑ "Les élus" (in French). Conseil Départemental du Cher. Retrieved 29 July 2017. ↑ 2.0 2.1 "Département du Cher (18) - Résumé statistique". Publications et statistiques pour la France ou les régions (in French). Institut national de la statistique et des études économiques - INSEE. Retrieved 29 July 2017. ↑ 3.0 3.1 "Populations légales 2014 des départements et des collectivités d'outre-mer" (in French). Institut national de la statistique et des études économiques - INSEE. Retrieved 19 July 2017. ↑ 4.0 4.1 4.2 "Historique du Cher". Le SPLAF (in French). Retrieved 29 July 2017. ↑ "Bourges, France - Köppen Climate Classification". Weatherbase. Retrieved 29 July 2017. ↑ "Département du Cher (18)". Géographie administrative et d'étude (in French). Institut national de la statistique et des études économiques - INSEE. Retrieved 29 July 2017. ↑ 8.0 8.1 8.2 "Régions, départements, arrondissements, cantons et communes" (PDF). Populations légales 2014 (in French). Institut national de la statistique et des études économiques - INSEE. Retrieved 29 July 2017. ↑ "Département du Cher (18)". Comparateur de territoire (in French). Institut national de la statistique et des études économiques - INSEE. Retrieved 29 July 2017. ↑ "Décret n° 2014-206 du 21 février 2014 portant délimitation des cantons dans le département du Cher" (in French). Legifrance.gouv.fr. 26 February 2014. Retrieved 29 July 2017. ↑ "Cher" (in French). habitants.fr. Retrieved 29 July 2017. Wikimedia Commons has media related to Cher. This page was last changed on 12 November 2017, at 23:28.